During EA's Summer Showcase live stream, EA has shown off some new features for the Wii U versions of Madden 13 and Fifa 13, typically focused on the GamePad's touchscreen. In Madden, play calling is done directly on the touchscreen, which isn't that much of a significant improvement over selecting plays from the main screen. However, you can also use the touchscreen for pre-play adjustments. In Fifa, there are a ton of enhancements that takes advantage of the Wii U's capabilities. You can pass via touchscreen, aim at a specific spot on the net when you attempt a goal, and even get a first-person view of your selected player's surroundings using the GamePad's gyro sensor while the ball isn't in play. Manager mode is also much more streamlined as you don't have to pause the game to make adjustments. EA stresses the importance of making the experience simple for casuals, and though these changes sound like welcome improvements, EA's focus on Wii U as just another casual-driven device like the Wii has got me worried. 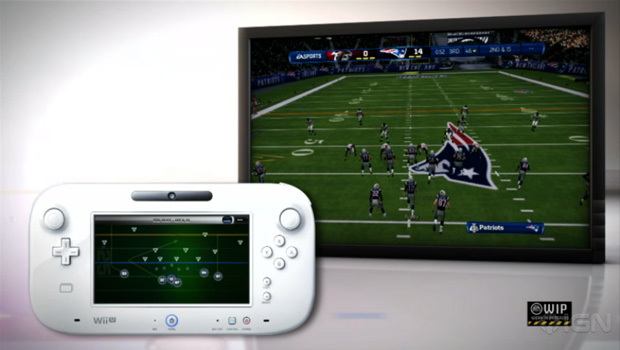 Both Madden and Fifa for Wii U will launch alongside the console later this year.